2018 Tax Forms Shipping Now! 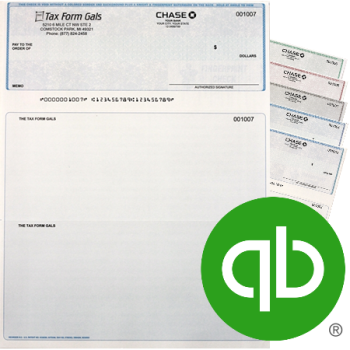 Checks are printed with your business and bank information, and are ready to fill out with your accounting software. Add your logo for no additional charge! Top-of-the-line security features are built into every check. Most checks ship within 48 hours on business days. For first time orders only. Or fax to 866-226-5121. 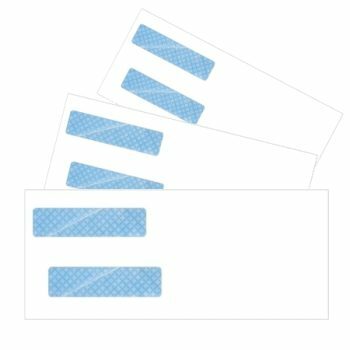 For new orders, upload a logo to print on your checks. Must be .JPG, .PNG or PDF file. Logos are printed in black ink only. Select a quantity and add to shopping cart. If you’d like a proof of a NEW order, please include your email address here. Discounted business checks compatible with your software. From QuickBooks™ checks to Peachtree™, ProSystem FX™ checks to Cheque Mate™, we have checks for ALL types of accounting software. Simply tell us your check-printing software when you order and we’ll guarantee compatibility. Our security features are comparable and compatibility is guaranteed with your software. Why spend so much on checks when you can rely on Discount Tax Forms? Just tell us your software and check style, upload a voided check and.or a logo, select your quantity and we’ll start processing your order immediately! Most checks ship within 48 hours! Top-of-the-line security features exceed guidelines for a high level of protection, at affordable prices! Our unique, gold security paper is UV Dull. This means that the paper is not as bright white as conventional check stock, allowing allowing the fluorescent security ink to appear blue under a blacklight. 1] Amount Line SEL Ink/Void Feature – The amount line is printed with solvent, erasable ink that turns white or bleeds when attempting mechanical or chemical alterations. The amount line (US Patented) is also printed with a different pantograph background than the signature area and balance of the check. The patented use of multiple pantograph designs produces voids through different density settings. 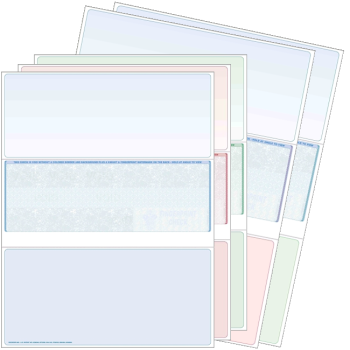 2] Unique Borders – The borders on the left and right are unique and interwoven with hidden, covert features that are difficult to copy or scan. On multi-color checks, the border is two colors. 3] Rainbow Prismatic Versions – The pantograph check design is printed with graduated colors. These versions are the most difficult to copy and include a VOID copier security feature. 4] Micro Printing – The bottom line border and endorsement on the back are micro-printed with Fingerprint Security™ and can only be seen when magnified. 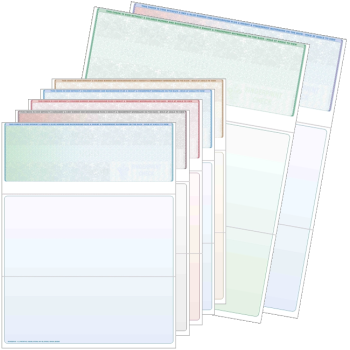 Micro-printing cannot be photocopied or scanned. 6] Fingerprint Hologram (optional) – A true hologram that cannot be reproduced on copiers or scanners is available. 9] Dual Watermarks – The artificial Knight™ and Fingerprint Watermarks cannot be photocopied and may be seen when holding at an angle or under a black light. They are coin-reactive and turn grey by rubbing with a coin. 10] Fluorescent Fibers – The artificial fluorescent fibers may be seen when viewed under a blacklight. Our small business is ready help yours! Software compatibility is guaranteed! If you have any problems, we will replace the product or refund your money.